Since being in London, I am becoming more and more into art and fashion exhibitions! I have never had the opportunity to attend so many and I am taking full advantage! They are not just beautiful or entertaining it's a day of fun, it's visual information and inspiration. This exhibition in particular just happened to be surrounded around fashion and celebrating the 100th founding anniversary of the infamous Spanish designer Cristóbal Balenciaga! I knew this designer was famous for his garment construction but hadn't understood the breadth of his impact on fashion until seeing some of his original work in person. I am such a visual person so getting up close and personal is how I learn best! His garments are so impeccably made yet simple and alluring in many ways. He changed silhouettes in his own way and you really get to see that in this exhibition as they X-ray the fashion and reveal – literally – what lies beneath the sculptural creations. His designs had such quality and were so distinct that he insisted buyers looking to reproduce his designs for high-end departments stores actually buy the garment rather than paper patterns. This was to ensure that the quality of the copies echoed that of the House of Balenciaga as closely as possible. The price for such a design was even higher than those for private buyer since they were buying the rights to reproduce the design as many times as they wished. I loved that upstairs you would explore current designers and their garments that had strong Balenciaga influence. Some were very easy to see and others were simply inspired by changing shapes and exploring different structures. I found this exhibition really helped me to better understand who Balenciaga was as a designer, his influence on those who followed him and why his designs are so timeless. I was very inspired and the quality that his designs showed really helped me to appreciate the art of design. This exhibition is open until the 18th of February and I recommend anyone thinking about going do so! You will not regret it. 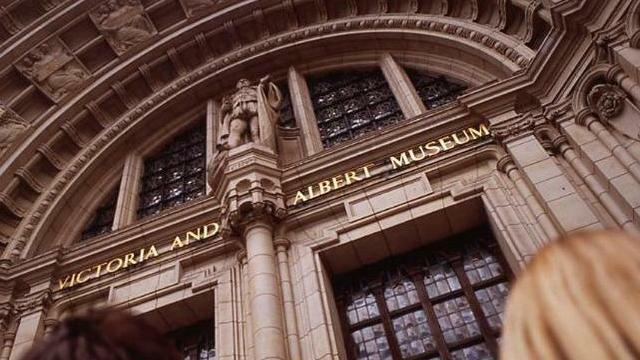 Not to mention the V&A has a ton of other free art to peek at while you are there!